I love it when apps execute something simple amazingly well. Cubic Frog develops and sells Gel Mania, a 99¢ iPhone and iPod touch game app. 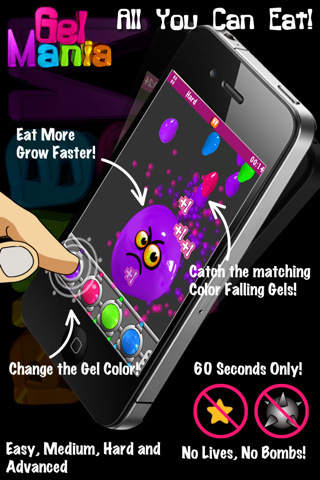 Gel Mania is a catch game where you are a color changing blob that has to match its color with falling goo to absorb it. This is a one touch game with over a hundred levels, achievements, customizable skins, and Game Center support. This review was done using an iPhone 3GS. Gel Mania is an app that is absolutely perfect for both children and adults. Cubic Frog Apps took the most simple concept and turn it into a fun, fast, challenging arcade game of sorts. You have 4 buttons to press during the game, each with their own color. You change your main blob using these buttons to match the falling gel. In order to collect and grow in size, you have to prioritize one color over another as they fall from the top of the screen. Each gel falls at different speeds so the faster it goes, the more entertaining it is. Your blob will grow in size as you collect gel and that makes it both easier to collect gels but also makes it more difficult to avoid bombs and shrinking mushrooms. Speaking of mushrooms, I love the Mario reference! The graphics boil down to shiny gels with bright colors and glossy reflections. Gel Mania provides several free skins for the gel textures and colors. I can’t thank them enough as a color-blind reviewer. The black-white-grey-red “Splatorama” theme is my personal favorite and it’s much appreciated. The buttons you push are very clear and well designed, giving anyone a one-look understanding of the entire game. You even get the ability to add little faces, backgrounds, and other aesthetic changes through rewards that you unlock by getting higher Gel collecting counts. 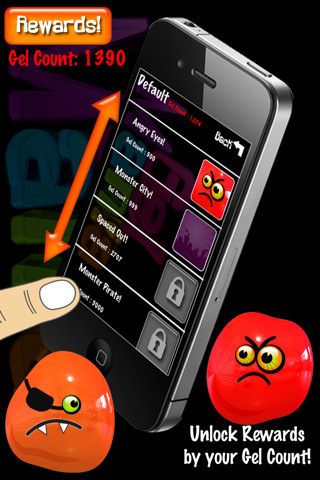 With such simplicity, Gel Mania takes 2 major features of the iPhone and gives it an entertaining, cute, fun experience. A great way to pass the time or to actively play. Perfect iPhone app. Seriously. AppSafari review of Gel Mania was written by Joseph Ho on June 21st, 2011 and categorized under Action, App Store, Arcade, Featured, Games, Resource Management. Page viewed 5733 times, 3 so far today. Need help on using these apps? Please read the Help Page. Thanks for the review, I got it and I love it! This game is just fantastic. Colors, sound… everything about it is just perfect. I love it when the blob grows in size! and the different skin colors makes it even more fun, I never get tired of it. This is such a cool game. colorful and fun!